I have fallen in love! 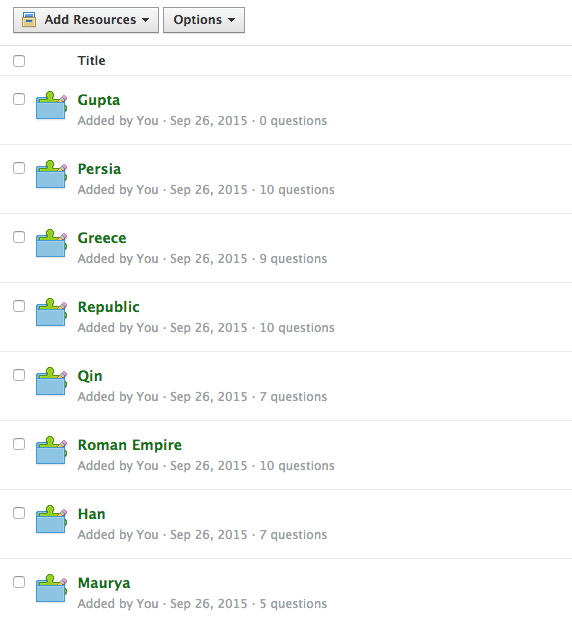 My love is the Schoology quiz bank feature. I teach sophomores world history, so I categorized my question banks by time period, then by topic (such as political), and finally by civilization. The extreme organization allows me to easily repeat questions on later quizzes. 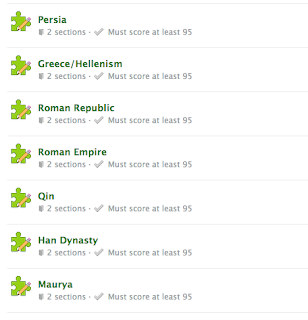 Here is what my classical political civilization question banks look like. As for each questions, I utilize Schoology's feedback feature. Each question has an explanation to why the answer the student chose is right or wrong. By using instant feedback, I hope to save time in class. I should not have to explain as many questions to the students. Also, the students can instantly see their misunderstandings of a topic and progress to the next attempt or quiz. Below each question, Schoology allows the user to input general feedback for an incorrect or correct answer. Here I am pasting larger more general understandings of the topic. My intent with these questions and quizzes is to have students earn as close to 100% as possible. 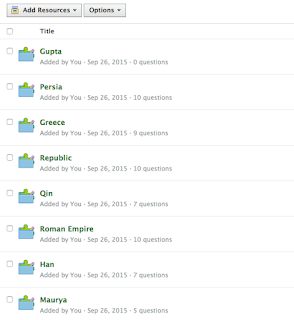 I set up my first seven quizzes in a student completion checklist. Students will have to pass each quiz with a 95% or higher to move to the next quiz. I want my students to know the content, and I want them to know it so much they have to pass the checklist with a understanding of at least 95%. 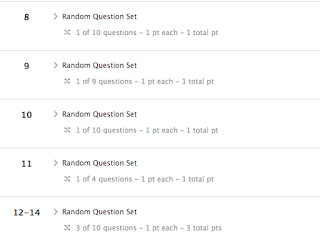 Each quiz has questions from the core set and then random questions from previous sets. 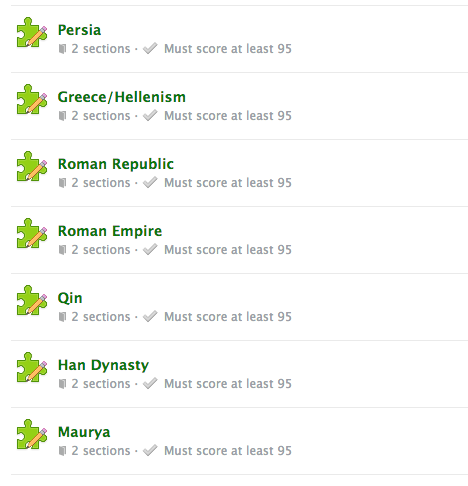 For instance, the Han Dynasty quiz has seven Han Dynasty questions and random questions from Greece, Rome and Persia. My hope is to continue this process throughout the year. Eventually the students will see each of these so many times the content will be ingrained in their brain. It is so easy to add questions from previous banks. 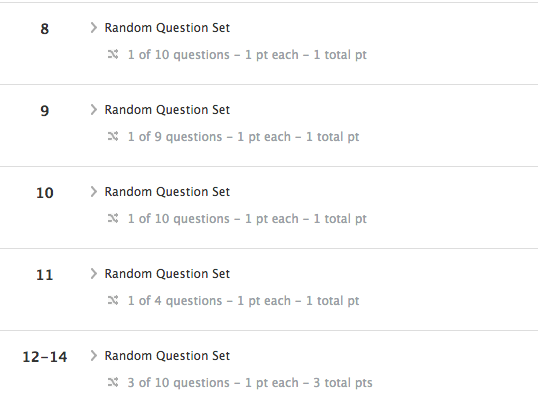 Schoology allows the user to choose random questions, so each quiz will be different for each student. Also, each time the student takes the quiz it will be different! With the feedback feature, the student should not have to go back to their notes to find the information on why or why not the question is right. The feedback will tell them instantly so they can progress through the quiz.